Your cycling routine shouldn't be punishing on the sensitive tissues between your legs. Groin soreness is a serious indicator of an improperly adjusted seat, and should be addressed immediately to avoid permanent damage. Choosing the right seat and setting it correctly for your proportions and riding style can help you pedal longer distances without risking an injury. 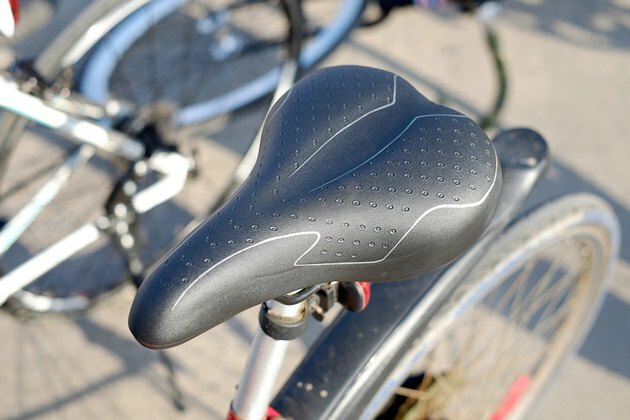 The type of seat you choose is dependent on your cycling style and your body proportions. First and foremost, a good seat supports your weight by redistributing it to your sit bones, the bony protrusions of your pelvis located in either buttock. You can find your sit bones by sitting on a flat, hard surface and feeling for the firmest contact points. Any seat you choose shouldn't have too much padding, since the extra cushion can redistribute your weight to the areas between your legs, where sensitive tissues can become damaged on longer rides. Your seat height is a crucial adjustment for eliminating crotch pain. With the bike leaned against a wall, mount your bike and raise or lower the seat until your knee is just slightly bent at the bottom of your pedaling stroke. If you have to rock back and forth on your hips to reach the pedals, your seat is too high, and you'll generate more pain and chafing in your groin. Ideally, your seat should be perfectly level so that you can lean forwards and grab the pedals without putting any pressure directly between your legs or sliding forwards or backwards. If you find the nose of the seat too high, you can tilt it slightly downwards to eliminate any pressure. Numbness is a good indicator of an improperly tilted seat, and should be taken as a serious warning sign that you could be doing damage to the tissue between your legs. Different riding styles put different amounts of weight on your sit bones depending on the demands of the activity. A cycling racer usually wants a narrow seat that won't chafe during high-intensity sprints. You'll put more weight on your hands and feet, and won't need a lot of padding. A casual rider or commuter should look for a padded and comfortable seat since you'll have less weight on your hands and feet and more on your rear. Liberty Bicycles: Are You Riding The Right Bicycle Saddle? What Is the Proper Way to Sit While Riding a Bicycle?